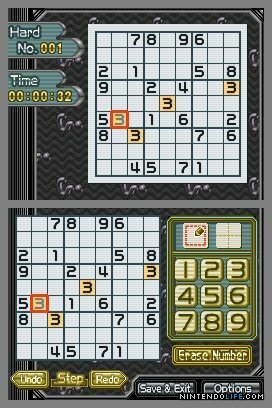 i have a couple of longer games i’m in the middle of, so i thought i’d write a quick post on sudoku gridmaster for DS. this one of those cases where i bought a game purely because it was published by nintendo (yes, i’m a nintendo fanboy) and it was cheap, but was a pretty unnecessary purchase since i’ve hardly made a dent in all the sudoku puzzles available in the first two brain age games. just going by numbers, the first two brain age games include about 100 puzzles each, and this one includes about 400, grouped into varying levels of difficulty. in sudoku gridmaster you earn stars by completing puzzles, with the number of stars varying with how difficult the puzzle is and how quickly you finish it. accumulating a certain number of stars just unlocks more puzzles, and at a certain point you’ll also unlock a “ranking” mode where you’re presented with a puzzle selected randomly among the main mode’s puzzles and given a score, which seems pretty pointless to me. the game’s interface feels slightly more streamlined to me than the brain age games. there’s no zooming in/out to fiddle with, and you can easily select the number you want to input from on-screen buttons instead of writing them by hand (although there is a handwriting recognition option which seems to work fine). adding notes in the four corners of a box is also easy to do via on-screen buttons. the presentation overall is pretty clean and generic but non-offensive, and you can select three different types of background music. all in all this was a perfectly acceptable, although perfectly forgettable, experience. when sudoku was first popular my sister got into it and finished all the puzzles in the first brain age, so after some research i ended up getting her platinum sudoku by ubisoft which supposedly features 20 million puzzles (???). platinum sudoku also apparently includes a few other types of puzzles, including kakuro, which i don’t know anything about, but other than the large number of puzzles i don’t have any point of comparison between that and the various other sudoku DS games available.